Andhra Pradesh Tirupati, The temple town is situated amidst the thickly wooded hills and deep forests of Chittoor District, in the south eastern part of Andhra Pradesh. Andhra Pradesh Tirupati is a highly revered pilgrimage site of the Hindus, and also known as the world's richest temple. People from all over the world come to visit this Divine Destination, perched at an elevation of 750m in the Palkonda Hills. Lord Venkateswara, is known as ‘Lord of the Seven Hills’ and ‘Balaji’. Ramee Guestline Tirupati Hotel - 3 star 14-37 Karakambadi Rd. Tirupati temple is regarded as one of the most ancient temples, mentioned in Puranas and Sastras. Tirumala is one of the seven peaks of Seshachalam hill range and is a symbolic representation of the seven headed serpent God Adisesha, the snake on which Lord Vishnu reclines. Almost all the kings who ruled southern peninsula like Pallavas, Pandyas, Cholas, and Vijayanagar empire have revered and worshipped the presiding deity The Lord Venkateswara.The magnificent temple architecture, was developed mainly by the contributions made by kings during their rule. Some of the kings have their statues installed within the temple. Tirumala is the hill on which the temple is located and the town at the foot of the hill is Tirupati. Andhra Pradesh Tirupati Temple is one of the few temples in India where non Hindus are allowed into the inner sanctum. Devotees irrespective of religion stand in long queues for special darshans. During festivals the numbers of devotees exceed 1,00,000. Tirupathi is a major tourist place because of the 'Divine Darshan" and the added natural attractions. Accommodation - There are all types of accommodation for the people to visit at Andhra Pradesh Tirupati temple– Star to Budget to Dormitory. Shopping - Handicrafts like Woodcarving and Kalamkari, special Whitewood toys and Tanjore style Gold leaf Paintings.TTD publications, CD & Cassettes are also available. Horsley Hills. The most picturesque, scenic, picnic and summer resort is situated at an altitude of 4200 feet above sea level near Madanapalli, in Chittoor District. It was built by Mr.W.D.Horsley, a British member of the civil service and then the District Collector of Cuddapah, to spend his summer on the top of the hills. Chandragiri- Located 12 kms from the temple town, it was once the former capital of Vijayanagar Empire. Magnificent forts and fascinating mahals are there. The Fort is at a height of 183 m on a huge rock, built in 1000 A.D, and was later improved by the Vijaya Nagar Kings. Chandragiri signifies the “Hill of the Moon” and is traditionally associated with the Moon God who is said to have performed penance at this place to please Lord Shiva. The most important palace inside the fort is the Raja Mahal and the magnificent Rani Mahal with tall pyramidal towers and façade decorated with foliate and geometric motifs, is close to this. 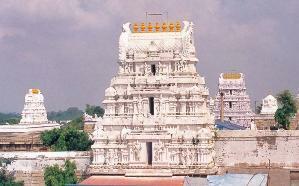 Temples - Apart from Andhra Pradesh Tirupati temple, there are other temples in Chittoor Dist. Kapilatheertham ( 1 1/2 kms away) where Lord Shiva is said to have blessed Sage Kapila with a vision of himself and his concert. The Temple of Alamelumaga at Tiruchanur, 5 kms away from the temple town. Srikalahasti, dedicated to Vayu, the Wind God. Srikalahasti town is located between two steep hills on the southern banks of the river Swarnamukhi, a tributary of river Pennar. This place is famous for the art of Kalamkari fabrics. Karvetinagaram with The Venugopala Swamy Temple, Skanda pushkarani and the Old Palaces. Narayanavanam, a big temple dedicated to Lord Kalyana Venkateswara swamy, is here. It is believed that the marriage of Lord Venkateswara Swamy with Goddess Padmavathi Devi took palce here. Nagalapuram Temple is said to have been built by Sri Krishnadeveraya in memory of his mother Nagamba. The Sun Festival, held in March, is a very important event here. During the festival the first rays of sun falls on the feet of the first day, on the abdomen on the second day, and on the face on the face on the third day. Sri Siddheswara Swamy Temple at Talakona. Many childless couple visit this temple for getting children. 4 kms away from the temple, scenic and picturesque water falls in the midst of thick forest. Varasiddhi Vinayaka temple at Kanipackam, 13 kms from Chittoor. Reddemmakonda, a famous Pilgrim center is situated on Madanapalli - Gurramkonda - Cherlopalli - Rayachoti - Cuddapah road. Gurramkonda, which has historical and archaeological importance, is located in between Madanapalli - Rayachoti - Cuddapah Road at a distance of 29 km from Madanapalli and 12 km from Vayalpad. The Ragini Mahal and Maqbara Tomb and the Fort are worth a visit. Kalyani Dam, a picturesque Tourist and Picnic spot, 25 kms away. By Rail: The nearest railway station Renigunta, 10 kms away, is well connected with major cities. By Road: Tirupati is linked by regular Bus Services with important places Chennai (130 Km) Bangalore (240 Km) Hyderabad (572 Km) Vijaywada (380 Km) Chittoor (61 Km).